Today is the day we celebrate Guy Fawkes ‘having a go’ but how much do you really know about the 5th November celebrations? 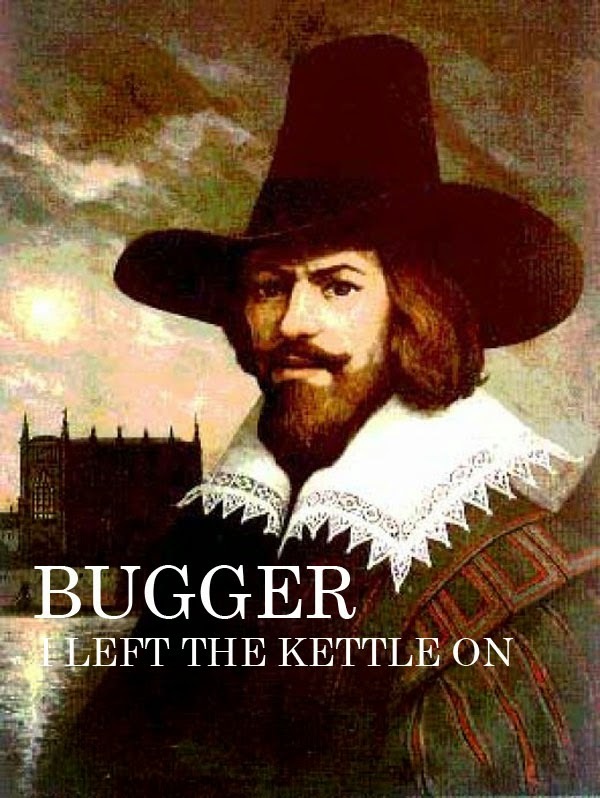 1) Guy Fawkes was not his real name, it was his stage name for when he liked to dress up in bawdy underwear and strut around Ole London in nothing but his breeches. In 1605 he misheard a conversation in the local public house and believed that under the houses of parliament was barrels of Fun Powder so went to investigate. Records show that he was found stark naked doing something unspeakable with a yard brush whilst emptying barrel after barrel in a quest for Fun Powder. 2) The word firework comes from the Latin word ‘fire’ and the old English word for work, ‘work’. Firework was a job that involved starting fires for a living, one of the most famous fires took place in 1666, called the great fire of London it was started when a baker on Pudding lane left his iPad on charge overnight and a short circuit sparked a small bush fire in his wife’s beard. London was destroyed in the fire and they rebuilt it with the help of Nubian slaves that had recently become unemployed after building the fireproof pyramids. 3) The smallest firework ever produced measured .00002mm in length and was lit on the 5th November 2009 by Mr Derrick Onkey of Bradford. The resulting explosion launched Derrick high into the air whilst shouting ‘Fracking Hell’ coining the now popular craze for Fracking. He landed unharmed in Skegness and was quoted as saying ‘What the Fracking hell is this shot hole?’ Which we think is to do with the packing cartridge that held the ‘shot’ in his firework. 4) Sausages are commonly called bangers due to their explosive properties which is why they are kept in fridges at Supermarkets. When you buy a pack of ‘bangers’ you have exactly sixty minutes until they warm up sufficiently to ‘go off’. The worst banger disaster occurred at Sausagefest in Swindon when a two foot long Cumberland burst in a shower of lips, eyes and arseholes splattering sausage goers with meaty rain. 5) Eat a curry and edible glitter for a stunning indoor toilet display the next day. 6) Blackpool was host to the worlds biggest rocket when it erected the Blackpool Tower in 1824. Many attempts have been made to set it off with the hope that it takes Blackpool with it. 7) Popular dishes for November 5th celebrations are mushy peas, hot dogs and bonfire toffee. It wasn’t always like this, up until 1979 traditional food included boiled eggs, chocolate dipped brussels and cabbage crisps. November 6th was known as the Big Stink which was moved to December 26th and forms our now traditional Boxing Day. 8) Guy Fawkes came up with the gunpowder plot after receiving his gas and electric bill and finding out that MP’s had been secretly claiming for candles on second homes. He also shared a nations notion that all MP’s are out of touch with reality and we would all be a lot better off if we could catch all the hot air produced in parliament to use to heat our homes. Oh, he also believed they were all tossers. He was only caught at the last minute because of his evil looking pointed beard and the fact that he was carrying a barrel with the words ‘gunpowder’ written on it and asked for a match. 9) In firework etiquette it is expected to go ‘wow’ and ‘ooo’ for the first few, then go silent for the rest as you realise they are really, really boring despite the packaging promising ‘golden showers’, ‘fairy sprinkles’ and ‘fiery sparkles’ for essentially the same spray of sparks.